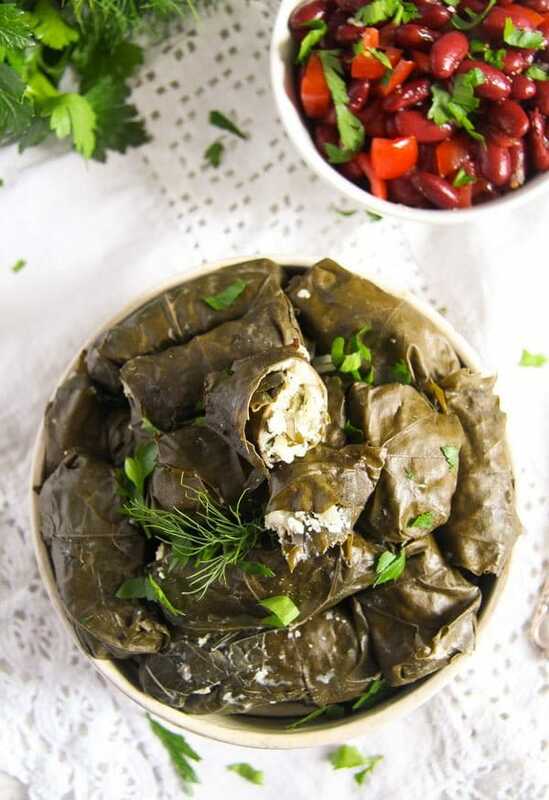 Delicate stuffed vine or grape leaves with a melt-in-your mouth ricotta and rice filling with lots of dill and parsley, a Romanian vegetarian recipe for vine leaves. I loved cooking for this Stuffed Leaves Series on Where Is My Spoon. 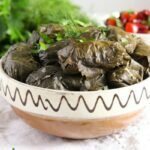 I have always loved Sarmale – Traditional Romanian Cabbage Rolls with Rice and Pork, which my grandmother cooked on a regular basis and I have experimented with some other kinds of stuffed cabbage or vine leaf rolls myself, delicious recipes like these Vegan Rice Cabbage Rolls with Sauerkraut or these Syrian Stuffed Leaves with Rice, Garlic and Leaves. But cooking for this particular series “forced” me into going even further when it comes to stuffed cabbage or vine leaf rolls, trying new combinations I had never even considered before, just like in the case of these wonderful Stuffed Vine Leaves with Ricotta, Rice and Herb Filling or the vine leaves with fish filling, which I will post later this week. Another recipe that is easier to make than one would think at first glance. 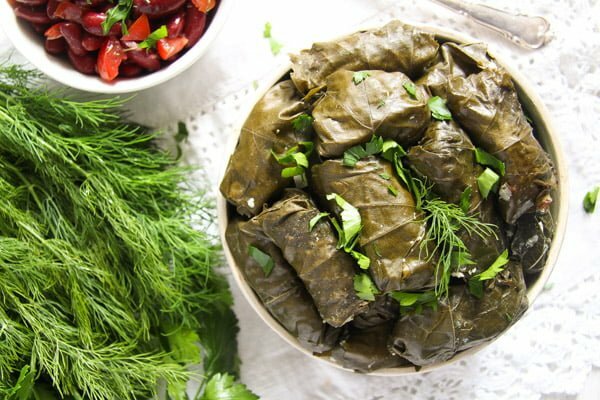 People tend to think that making stuffed cabbage or vine leaf rolls is really difficult, well, the thingies do look impressive after all, they really make you think you might need some special skills or lots of experience to make them properly. 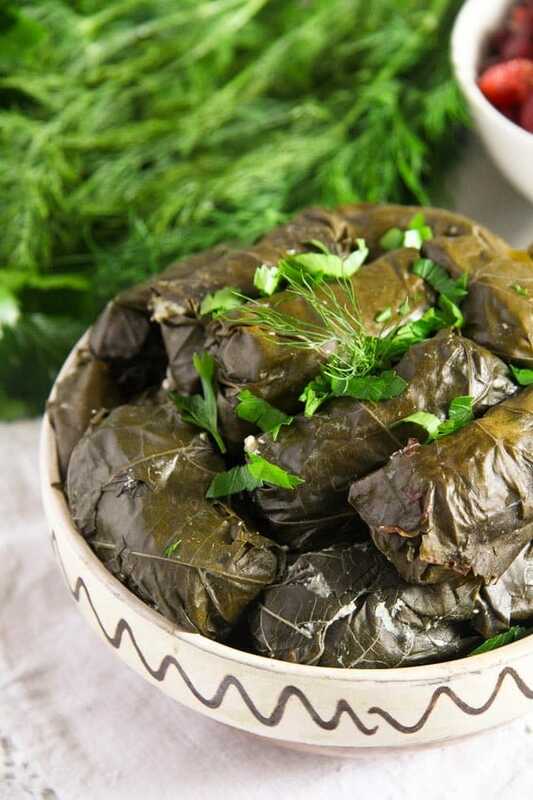 Rest assured, you will not need any special skills and even a beginner will be able to roll the Stuffed Vine Leaves with Ricotta, Rice and Herb Filling. After making 3 or 4 rolls, you will get the hang of it and things could not get any easier. However, rolling the parcels will take a bit of time, so it is better to make this recipe on a day when you are not stressed with time. 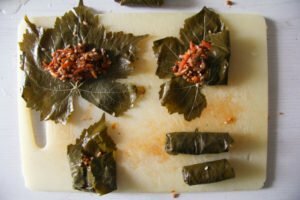 I used vine leaves from a jar to make the rolls, they are usually readily available in any larger supermarket around here. I boil the leaves shortly to make them softer, some people don’t do that, but I have always done it, the way my grandmother always did and the way my Syrian friend who gave me the recipe for the Syrian Stuffed Leaves with Rice, Garlic and Leaves does as well. Let the vine leaves drain well and cool a little bit before using them. The filling was enough for 32 rolls in my case. You might have a bit more or less depending on the size of your leaves and how large you make the rolls. Prepare a few more vine leaves than you would think you need, some leaves will break and some will be two small for filling. 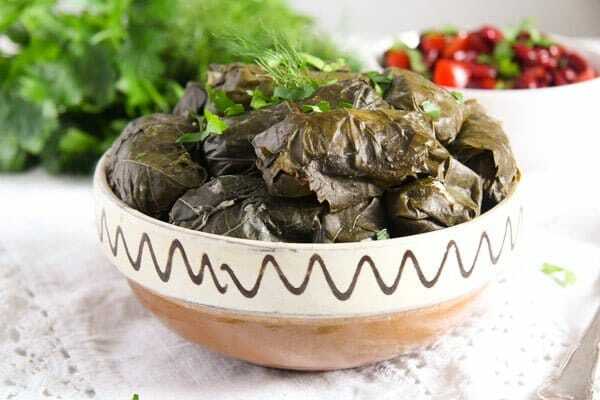 In such case, use two vine leaves to form one roll. Just place the two leaves over each other in order to form a larger “leaf”. I also soak the rice in boiling water before using it. This makes sure that the rice is properly cooked inside the rolls, there’s nothing worse in this case than biting on a roll full with grainy rice, the rice in the rolls should be really soft. That is also the reason why I prefer using short grain rice (or what we call Milchreis in Germany) for making cabbage or vine leaf rolls. I used to take the regular long grain rice before, but although the rolls were tasty, I was never satisfied with the texture, I have always thought they should be softer, squishier. So, I switched to short grain rice and voila, my cabbage or vine leaf rolls finally have that comforting structure I remember from my childhood. In Romania we would use urda, a moist, fresh, kind of sweet cheese to make these rolls. However, I have rarely ever tasted urda in Romania (my grandmother didn’t like it, so she never bought it) and, of course, I could hardly buy any urda in Germany. So I always replace urda with ricotta, which is pretty much the same thing, if you ask me. 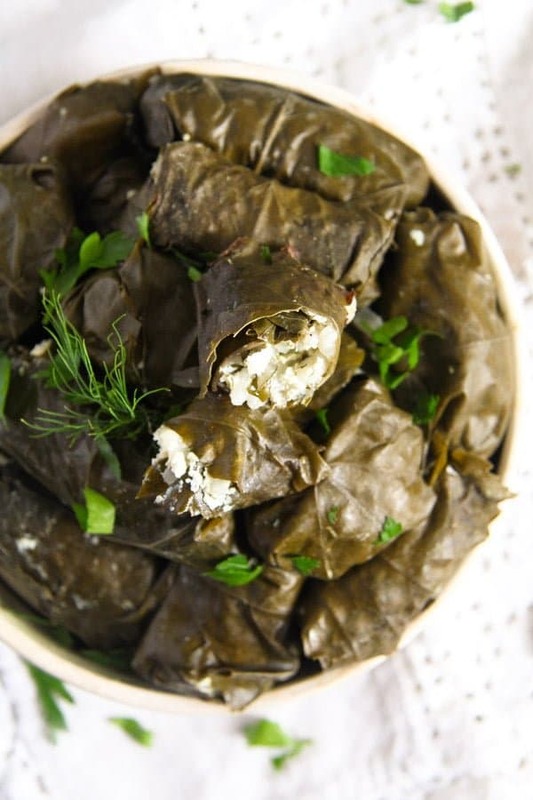 The Stuffed Vine Leaves with Ricotta, Rice and Herb Filling require the use of lots of herbs. 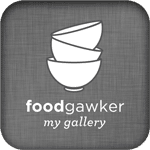 Ricotta has a pretty delicate taste and if you don’t add other ingredients that have a stronger flavor, you might not be so pleased with the resulting dish at the end. So do make sure that you add all the required fresh herbs and that you are very generous when seasoning the filling. Taste and add more salt, pepper, chili flakes/cayenne pepper until you are satisfied with the flavor. 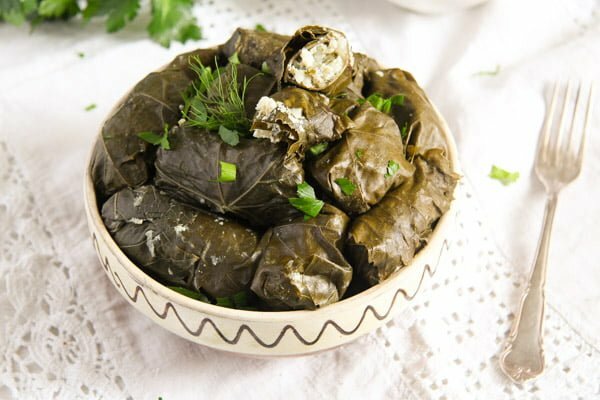 The recipe makes about 32-35 Stuffed Vine Leaves with Ricotta, Rice and Herb Filling and serves about 3 people with a salad on the side (a nice bean salad for instance, that is what we had) or 5-6 people as an appetizer before a more filling main dish. Remove the stems from the herbs, make sure you have sufficient leaves for the filling (about 20g/ 0.7 oz fresh leaves) and chop the herbs very finely. Chop the onion very finely as well. Give the herbs and the onion to the rice. Add the ricotta and spice the filling generously with chili flakes or cayenne pepper to taste and salt and pepper. Taste the filling and make sure it is well seasoned. Place a vine leaf on the working surface. Add about 2 teaspoons of the ricotta filling (depending on the size of your leaf) in the middle-lower part of the leaf. Fold the left and right sides of the leaf over the filling, then form a roll, starting to roll at the base of the parcel. Place the roll with the seam facing down in a small cooking pot. Repeat until you have used all the filling, arranging the rolls nicely and tightly in the pot. Heat the vegetable or chicken stock and pour it over the rolls, they should be barely covered with liquid. Cover well, bring to a boil, then lower the heat and simmer for 1 hour. Check to see if the rice is soft, if not continue cooking for 5 -10 minutes longer or until the rice is soft. I never tried stuffed it with ricotta but sounds amazingggg!